Everyone sems to have a different reason for starting Kendo. I first saw Tomi Otani practice when I was learning Judo from his dad, Matsutaro. I then went on to read Roald Knutsen’s Musashi column in Judo Magazine. I was entranced to read that throughout his challenges with famous Japanese sensei he always broke even. I then got my hands on an import copy of Black Belt Magazine which ran an article on Dr Gordon Warner, the American kenshi who stayed on in Okinawa and despite the impediment of an artificial leg gained fame and nanadan in Japan. As things panned out, I met him in Japan in 1979. I believe his daughter now lives in the UK. 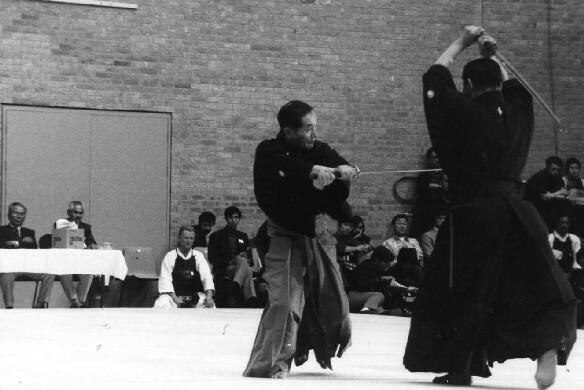 When the 3WKC came to England, it was an opportunity to see some of the then great sensei in action. I have attached a photo of Horigome and Ikeda sensei’s Kendo no kata. This one demonstration made me decide to move to Japan. Great stuff, and great pic!!! I bet you have a lot more stories and loads of pics as well. Some old guy who visited my dojo came up to me last month and started chatting about Gordon Warner to me. It took me a little while to work out just who he was talking about, but then I was quite impressed.